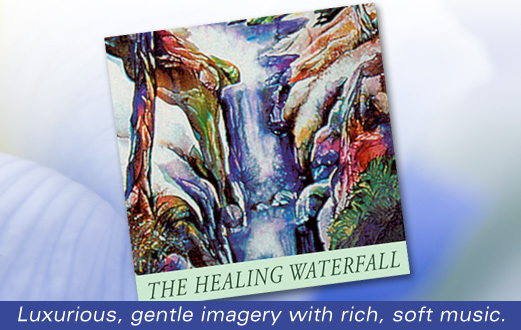 You’ll find The Healing Waterfall on a beautiful mountainside, waiting just for you. Slowly step forward into the pool, and let the water heal and soothe every part of you. This luxurious healing visualization is a favorite of guided imagery fans word wide. Includes beautiful soft background music. Winner Best Meditation Tool for 2012! Over 100,000 grateful listeners agree! The Healing Waterfall was voted as the “Best Meditation Tool” by About.com. It’s one of the best-selling guided meditation downloads of all time. This soothing program can help you tap into your own self-healing power. Use it for greater relaxation and tranquility in your every day life. Guided relaxation meditation is effective at combating stress and anxiety. Research also shows it can also have a positive impact on your immune system and overall health. This guided visualization for healing can change your outlook on life, as it has for thousands of others! Some of the hundreds of thank-you's from listeners who appreciate The Healing Waterfall. When I created The Healing Waterfall, my intention was to do something that would help people relax and access their natural inner healing ability -- a process I firmly believe in. I wanted to make a soothing program that everyone could relate to. I had no idea it would have the effect it has had. More than 100,000 people have purchased the cassette, CD, and now the download. It's been so gratifiying to receive the thank you letters from people who have had this program for years, and still use it. I'm grateful that Jill Andre did such a masterful job narrating the script of The Healing Waterfall, as she also did with The Healing Waterfall II, Lightbeing, and Visiting Angels.